Shakespeare Santa Cruz appeared on the UC Santa Cruz campus in 1981 with Audrey Stanley, a former president of the University of Bristol Dramatic Society with contacts in the Royal Shakespeare Company, as its Founding Artistic Director. In that embryonic first summer, Stanley enticed L.A.'s Will Geer Theatricum Botanicum to remount its Taming of the Shrew. For the official inaugural season in 1982, she directed King Lear, with the RSC's Tony Church as the maddening liege, while George Kovach of Berkeley Shakespeare Festival directed A Midsummer Night's Dream. 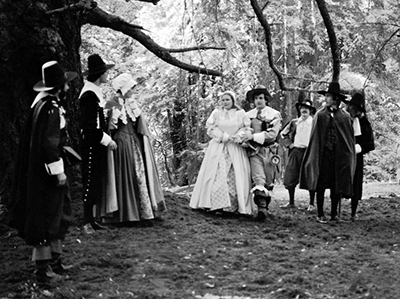 It was the following summer of 1983, after he was teaching at UCSC, that Edwards was tapped to stage The Merry Wives of Windsor. He brought Rucker in as assistant director and cast Dante Di Loreto, a recent UC San Diego graduate, as Fenton. The more successful a freelance theater director becomes, the more he or she travels. Weeks away from home, burning double-ended candles to rehearse, "tech" and open productions tests the best of relationships. Rucker was "a serial monogamist who was always happiest, strongest in the world, and doing his best work when he was happily partnered," according to Edwards. That summer's chance meeting with Di Loretto would lead to what, by all accounts, was his defining relationship. Despite the challenges of their independent ambitions, it would provide them both with emotional security for the next two decades. In its final stretch, it would also afford Rucker a lone film directing experience that could not have been more to his liking. In the early and mid-'80s, however, his travels were limited to California's Interstate 5, which connected Shakespeare Santa Cruz and City Stage. He also worked for two years as a Field Rep for Breakdown Services, picking up and delivering scripts by car for the casting assistance company. 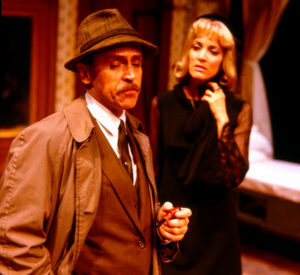 A 1984 City Stage adaptation of e e cummings' Him prompted The Los Angeles Times to send Don Shirley, whose bemused, encouraging review reported that, "Mark Rucker and Deena Gornick bring sexual tension and an elegant look to the most baffling sections of the play." The summer of 1985 would mark the entrance of another principle Rucker player, although their first encounters gave no indication of what was to come. 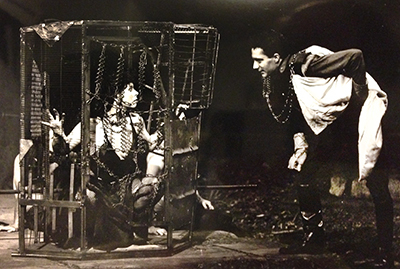 "That was my first year in a play at Shakespeare Santa Cruz," said Danny Scheie. "Mark didn't seem friendly to me, which we joked about later. I met him again the next summer when I was in Tartuffe at LATC. It was a huge, super-starry hit that just kept getting extended. I got my Equity card playing Damis with Ron Liebman and Jessica Walter and Jennifer Tilly. Mark was in L.A., still running City Stage, and because he and my boyfriend, Jack Zerbe, had become really good friends in Santa Cruz, he came backstage at LATC and we just hung out every single night. He showed me L.A. and we were young and drinking a ton and it was super exciting. We were best friends from that summer on." Stanley, her co-founder Karen Sinsheimer and their board had chosen Edwards to follow her as Shakespeare Santa Cruz' second Artistic Director. He accepted the position in time to schedule the 1987 Season, which included the company's first musical and, as it turned out, Rucker's first professional directing job outside his self-assigned Gardner and City Stage shows. "It was wild and classy, on a giant multi-level scaffolding of a set in the indoor theater there," recalled Nancy Carlin, who played April the flight attendant in Company as well as Beatrice in that summer's early-California-themed Much Ado About Nothing. "I remember Mark had a fashion designer friend named Peter Mitchell who did the costumes. We all had different silhouettes in the same shade of cream. Giant shoulders. Very '80s," she laughed. "I bought my suit at the end of the summer." "The work we were doing was really cutting edge," Edwards recalled. "It is not cutting edge to do the work we were doing now. But we were pretty out there. It was a brilliant group of people and Mark was absolutely a critical part of that adventure." That summer Rucker applied to Yale School of Drama, but as his mother remembered it, "Yale accepted only three MFA directing students and he was fourth that year. But they called the following year and said they wanted him." August 1989 marked one of Rucker's great leaps forward. It began with the opening of his critically acclaimed staging of Romeo and Juliet at Shakespeare Santa Cruz [ 5 ] and ended in New Haven among a new circle of theater artists as driven as they were talented. 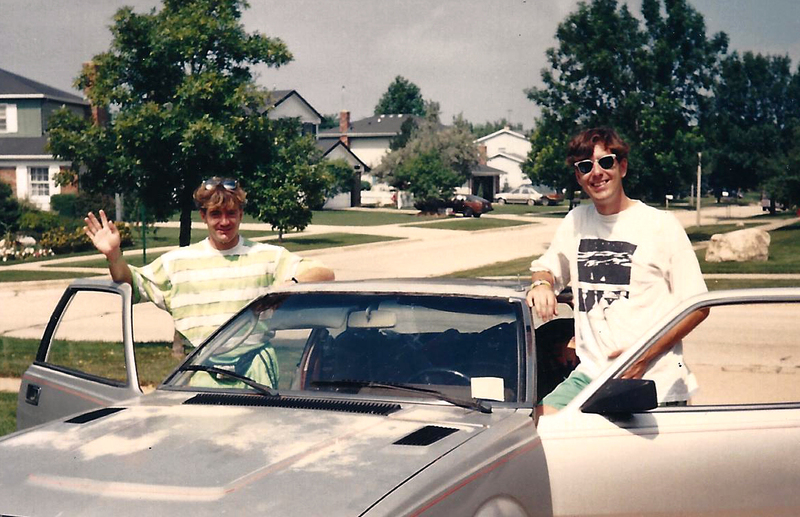 Connecting those milestones was a crazy cross-country car trip with Scheie that created a special, permanent bond between the two friends. Rising late on a Monday in the middle of that month, Rucker and Scheie fortified for the future with champagne, "a big boozy lunch" and some shopping. Over the next week they would wend their way across America, with Scheie recording the most memorable conversations, off-road encounters and kitsch stops (beginning with Castroville's "ginormous cement artichoke") in an hilarious journal. Passages from the two-man Iliad would be circulated among friends and read aloud at parties, giving a kind of mythic status to their careening beer-and-vodka run to New Haven. On their first day of class, Yale's first-year directing and dramaturgy students were no sooner introduced than they were asked to rank the three classmates with whom they would like to work. "We were sort of drawn to each other," said Catherine Sheehy, now a Professor Adjunct of Dramaturgy and Dramatic Criticism at the School of Drama and Yale Rep's Resident Dramaturg. "I remember his pooka shells and torn jeans and me in my Polo stuff. We actually put each other's name first on our lists." Their ongoing collaboration began with a December 1, 1989 Yale Cabaret staging of Susan Sontag's "The Way We Live Now" for the 2nd Annual World AIDS Day. She was also dramaturg for Rucker's first-year directing project, Tennessee William's problematic Kingdom of Earth, for which he could cast from the entire pool of MFA acting students. "I was a third-year student and it was the second semester," said Cindy Katz. "So I was literally one foot out the door when the casting notice went up and I saw my name there, along with Joseph Fuqua and Liev Schrieber." Katz' initial dismay at working with a first-year director passed quickly as the 30-year-old Californian with years of professional experience showed rare sensitivity for both text and actor. "It's a monster, just a monster," Katz said of Kingdom. "This woman just does not shut up. But doing that project with him was one of my greatest experiences. I was so lucky." In the second of his three years at Yale, Rucker was surprised to find another Orange County beach town native among the first-year acting students. "We took an instant dislike to each other, having realized that we were from rival high schools," Reg Rogers recalled. "He was a Sailor and I was a Sea King, and apparently high school rivalries run deep. Some time later, probably at rehearsal for a Yale Cabaret show, he comes in wearing a windbreaker that says George's Playroom [ 6 ] on the back. I said, 'I've been to George's Playroom!' And he says, 'That was my uncle's bar.' We were immediate friends from that point on." Rogers would be part of Rucker's and Sheehy's shared thesis project, an elaborate reworking of his favorite film from those childhood movie nights with Lester and Leslie. "In the Stage Door play, Hollywood is the big bad boogeyman who drains all the talent out of Broadway and kills hopes and crushes souls," Sheehy explained. "In Stage Door the movie, Broadway is the big bad wolf that hikes an actress' hopes and then crushes her to earth. Mark and I were more interested in actually indicting the medium we were working in as opposed to pointing fingers across media." "He'd managed to talk to the various estates and get the authorization to use both the film script and play script and combine them,” said Rogers, who was cast as Anne Luther, the role that Constance Collier played in the film. Their biggest challenge would be adapting quick-cut transitions that were a simple splice in the movie but a laborious set change on stage. To preserve that energy and rhythm Rucker and Sheehy imagined interspersing In-One [ 7 ] "Knee Plays" performed downstage. These would not only cover scene and costume changes, but advance Stage Door's theatrical boarding house milieu by having each character introduce him-or-herself to the audience through a personal performance. "To determine what each character's 'Knee Play' would be, Mark had all the members of the cast do a talent show," Sheehy said. "They could do anything. Lars Hansen did pea verballing. Sara Knowlton, who played Olga the pianist, played the cello. Mary Elena Hernandez played the ukulele. Mark and I then wrote little monologues for them to introduce themselves. It was such a Mark Rucker touch: His desire to look at the theater in the theater and then to come up with added material in a way that brought us closer together as a group while letting each actor show an individual talent." As their five-performance public showcase approached, the pair got a hard-knocks education in commercial rights. The ticketed run, which is the culmination of a directing student's Masters Thesis project, was slapped with a cease-and-desist order requiring all shows be canceled. "We had the rights from Turner, who had bought the catalog of movies produced by RKO," Sheehy said. "But Howard Hughes had held on to his rights for the seven movies in which Katharine Hepburn had starred, and the rights to those movies had gone back to 20th Century Fox. I had spoken to 20th and gotten a verbal okay from a guy named Lorraine Juris, but they accused us of having never obtained permission. How about if we don't charge for tickets? No. Finally a big entertainment lawyer who was a Drama School alum interceded and we got technical permission to do it for those five performances so long as we vowed never to produce it and signed a document to disclaim all our work on it. It was unfortunate, but we did get in those five performances." "And," said Rogers, whose 'Knee Play' was Juliet's Thou knowest the mask of night is on my face … speech, "it was a big hit." Mark Rucker had always had ideas, energy and confidence. But he emerged from the Yale School of Drama with those qualities kiln-fired by the approval of brilliant classmates who would become regular collaborators over the course of his life, including Sheehy, Rogers, Katz, and costume designer Katherine Roth, who would marry Sheehy. "I had everyone saying, 'How can you go back to California? You have to go to New York,'" he told the Los Angeles Times' Jan Breslauer in 1997. [ 8 ] "But I came back." It was 1992 when he returned to the friends and familiarity of Shakespeare Santa Cruz. 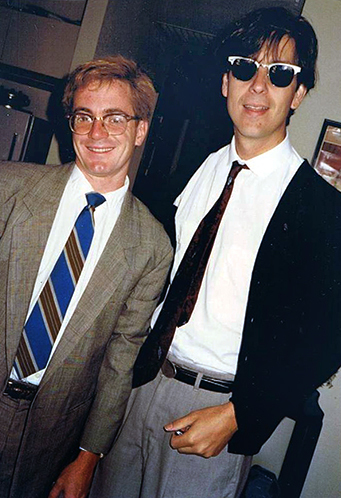 Edwards was beginning his sixth and final season as Artistic Director, with Scheie to follow from 1993 to 1995. That first summer back Scheie directed The Taming of the Shrew and Rucker directed Macbeth, bringing Sheehy out as dramaturg and casting Rogers. He cast a 19-year-old Susannah Schulman as one of the witches. "Mark and Danny had a clarity with Shakespeare that helped them make it very clear to the audience," Rogers said. "Everybody's doing it now, but that was the first time I'd seen anything like it. They used modern references to make things clear to a modern audience. They wouldn't change the lines but they'd dress people in such a way that you go, 'Oh I know who that is because I've seen Goodfellas.'" They offered him the available third slot, Alan Ayckbourn's Intimate Exchanges. The two-actor cast was already in place. 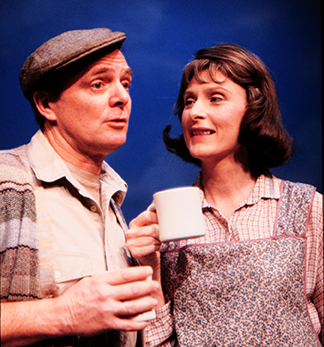 Kandis Chappell had appeared in a successful production of the same comedy at San Diego's Old Globe in 1987 and just received an LA Drama Critics Circle Award for lead performance in SCR's production of Ayckbourn's Woman in Mind the previous season. SCR Founding Artist Richard Doyle was already known to Rucker, who had seen him in SCR's The Tavern when he was 14. "I didn't want to tell him because I thought it would make him feel old," he joked to The Times' Mark Chalon Smith. [ 10 ] "But he was quite amused by it. I remember being so impressed by that show and his performance. It really had [an impact] on the direction I decided to take." 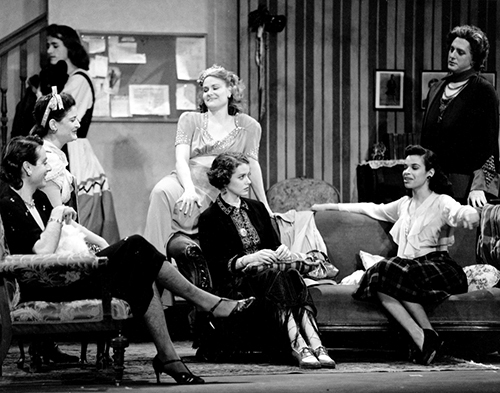 Intimate Exchanges was a success, and Rucker, who clearly had stimulated both box office sales and backstage camaraderie, was immediately offered the Second Stage production coming just two slots later. SCR traditionally held off announcing that fifth and final Second Stage title, in hopes a script in development could be a last-minute shoe-in. In 1993 it was Roger Rueff's So Many Words. 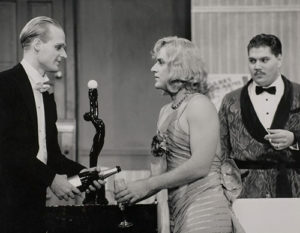 Again, the actors, the crew and the audiences so loved what Rucker did with the Second Stage season closer that he was offered the next production, Joe Orton's Loot, to open the smaller stage's 1993-94 Season. Just that fast he had directed three of four consecutive productions and found a theatrical home in his own hometown. In his review of Loot, the Los Angeles Times' Jan Herman called it "finely cast, sharply acted and ably directed. … Loot is also a tricky farce to stage, given its very British antic style. Director Mark Rucker has managed adroitly, however, with an ensemble of actors who fit their roles exceptionally well. They negotiate the ridiculous and never make fools of themselves." During this time Rucker continued his summer stagings in Santa Cruz (Damn Yankees in 1993, The Merry Wives of Windsor in 1994, and King Lear in 1995 – "all done with a kind of wild contemporary sensibility, but a love of classic stories," according to Edwards). He was also extending the number of theaters where he was a welcome guest director, with Indiana Repertory, A Noise Within in Glendale, California, and Yale Repertory Theatre, where in January 1995 Twelfth Night became his first professional staging in New Haven. After his fourth Second Stage production at SCR, the 1994-95 Season opener, A.R. Gurney's Later Life, he graduated to the big house. 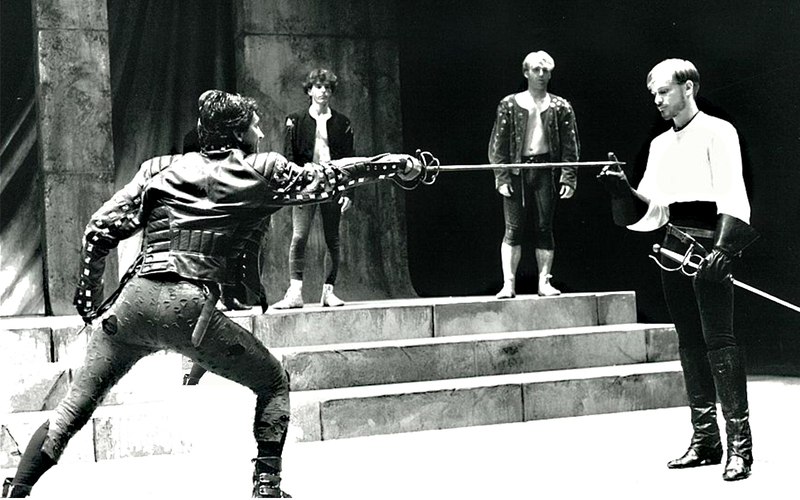 A 1995-96 Season production of Shakespeare's The Taming of the Shrew was an opportunity for his biggest splash yet. And he was determined to take advantage of it. Christopher Arnott, an arts journalist in Connecticut for more than 30 years, and Theater Critic for the Hartford Courant since February 2016, wrote frequently about Mark Rucker as the arts editor/theater critic at the New Haven Advocate and on his blog, New Haven Theater Jerk. He generously contributed the following to Theatertimes' profile. That Stage Door was magnificent. I did not attend Yale, and wandered in off the street to see it. I had recently moved to New Haven and saw that show simply because I’m a lifelong fan of George S. Kaufman. Every time I talked to Mark, that show came up. 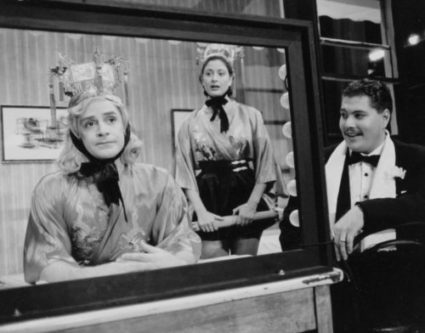 He loved that style of comedy and it bothered him that modern regional theater audiences weren’t supporting it. The thing about his Stage Door was that it made so many audacious choices, and they all worked. There was cross-gender casting. There were confessional moments done at the sides of the stage. There was this immense doll’s house of a set. The style would shift from snappy Hollywood banter to harsh realism. Mark didn’t see Kaufman (or Ferber, or Ryskind, or Veiller – he used a blend of the stage and film scripts) as quaint nostalgia. He knew there was depth and subtlety there. He was doggedly trying to figure out what special blend of theatricality and sincerity made the thing work in the first place, and how he could adapt that for today’s audiences. He was doing exactly the same thing a quarter century later with his Yale Rep production of A Streetcar Named Desire. I think I saw everything Mark did at Yale from Stage Door on, including some other student work and all those Rep shows he did afterwards –new work (both comedy and drama), classics, and oddities such as Tennessee Williams’ Kingdom of Earth and David Mamet’s The Cryptogram. One thing I always appreciated about him is that he wasn’t afraid of comedy. When he did Williams, or Guare, or Stoppard, or Shakespeare, these were balanced, light-and-dark, accessible shows, not pompous and pretentious or unnecessarily bleak. When he did Stoppard’s Rough Crossing, it wasn’t ironically funny, it was just funny. I championed his work in New Haven for decades, and especially praised the Shakespeare shows he did with student casts. (When Stan Wojewodski was the dean of the Yale School of Drama, one slot on the Rep season was given up to Shakespeare productions cast with graduating YSD actors. Mark was entrusted with some of the first examples of this.) He liked to quote the opening line of a review I did of what I still consider to be the best Measure to Measure I’ve seen anywhere: "Mark Rucker, that fucker, has done it again." His Measure to Measure was the follow-up to an equally cool Twelfth Night, whose cast included such future stars as Tom McCarthy (the filmmaker), Sanaa Lathan, Suzanne Cryer and Stephen DeRosa. Measure to Measure had a dark underground nightclub feel. Twelfth Night was staged around a swimming pool. Second inset – Danny Scheie and Mark Rucker. 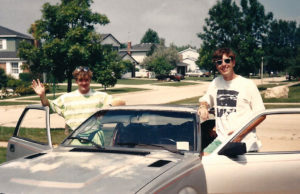 Fourth inset – Scheie and Rucker leaving parents Carl and Mary Scheie’s home in Libertyville, Illinois on the road to New Haven. 5. Read an excerpt of of Evelyn Gajowski's critical assessment of Rucker's staging of Romeo and Juliet in The Art of Loving: Female Subjectivity and Male Discursive Traditions in Shakespeare's Tragedies. 6. George's Playroom, owned by Gilbert Forbes, opened in Bell Gardens in 1947. Once after visiting his mother during a minor one-night hospital stay, Rogers and his father were headed home when "My dad said, 'Let's get a beer and play a game of pool. I know where there's a place around here.' The Playroom was taken by the city under eminent domain around 1989 for the Bicycle Card Club to be built on that spot. And who was George? In the November 18, 1948 issue of The Bakersfield California, under the headline "Kern Sheriff Sparks State-Wide Drive on Former Convict Gang," arrests are reported of the "round up of a gang of former convicts who have been terrorizing California cities for the past eight months. … Ten men are already in county jails in connection with burglaries of dozens of bars, restaurants and stores between Bell Gardens … and Chowchilla … and receiving stolen goods from the burglaries." Among those in custody was "George Belfield, operator of George's Playroom, a bar and restaurant in Bell Gardens." 8. 'All Popular on the Western Stage' by Jan Breslauer, Los Angeles Times, July 27, 1997. 9. 'Remembering the Gentle, Persistent, Calm, Avid Mark Rucker' by Annie Weisman Macomber, Catherine Sheehy, Danny Scheie, David Emmes & Martin Benson, Michael Edwards, American Theatre, September 17, 2015. 10. ''Intimate' Beginnings and Endings' by Mark Chalon Smith, Los Angeles Times, February 2, 1993.